In the hills of Asia. 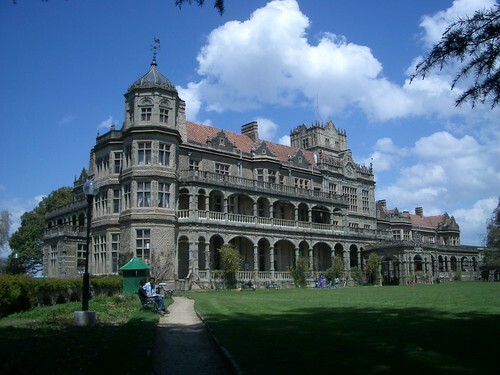 Photo of the Viceregal Lodge in Simla by Mat Booth used under a Creative Commons license. Barbara Crossette, The Great Hill Stations of Asia (Basic Books, 1999). Across Asia, European colonialists built “hill stations,” refuges from the heat and disease of the lowlands. Usually at altitudes between 5,000 and 8,000 feet, the hill stations were built at elevations too high for disease-carrying mosquitoes, even before the link between the two was known. As Crossette writes, “[c]olonialism came and went, but the hill stations are still there, from Pakistan on the old Northwest Frontier of imperial Asia, across India, Sri Lanka, Burma, Malaysia, Indonesia, and Vietnam to the mountains of Luzon in the Philippines, where Americans built one too. The hill stations are overgrown, often overpopulated, and no longer European now, but most have not lost their unique appeal.” In 1997, Crossette traveled across the region to visit the hill stations. This book combines her research and an account of what she found. Here is Google Book Search. Here is the first chapter of the book. Here is a bio of Crossette. Alexander Frater reviewed the book in The New York Times. Kenneth Champeon reviewed it for ThingsAsian. Daniel Costello wrote about it on his blog. Crossette describes the book as “a labor of love” in this interview with Harold Channer.